While we were over at Shari’s house the other evening, she had to get busy in her aviary putting some of her birds away before the sun went down and the tempeture dropped. She asked me if I could go down to the barn and put a blanket on their horse. Reno is a quarterhorse gelding, and is by far one of the most beautiful horses I have been around in a long time. He is the epitomy of every young girl’s dream horse. Standing at the better part of sixteen hands high, he is a golden palomino, the color of a jar of honey with the sun shining through it, with a cream colored mane and a tail that hangs all the way to the ground. You know, he looks just like the horse our Barbie’s owned. He is placid almost to the point of sleepiness and very people-oriented. I ducked in between the boards of the paddock and found the blanket thrown over one of the rails. Reno was plodding over to me from the barn at this point, wondering what I was doing in his space. When he was close enough, I softly blew into his nostrils to identify myself to him. He stopped and stood still and dropped his head to watch me with gentle regard as I tossed the blanket over his tall back and moved to his chest to start work on the fasteners in the front. He began to investigate my face and hair with his lips as I worked the buckles. Then he did not move one bit as I walked all around him to work the leg straps and then the belly buckle. As I came back around to his front he rubbed his head across my chest and slobbered on my shirt in approval. I found that little sweet tickle spot in the center of his chest and gave him a good scratch there with my fingernails. His head bobbed up and down in reaction to this, and his upper lip twitched uncontrollably. I put my arms around his neck and inhaled the warm sweet horse smell of him. 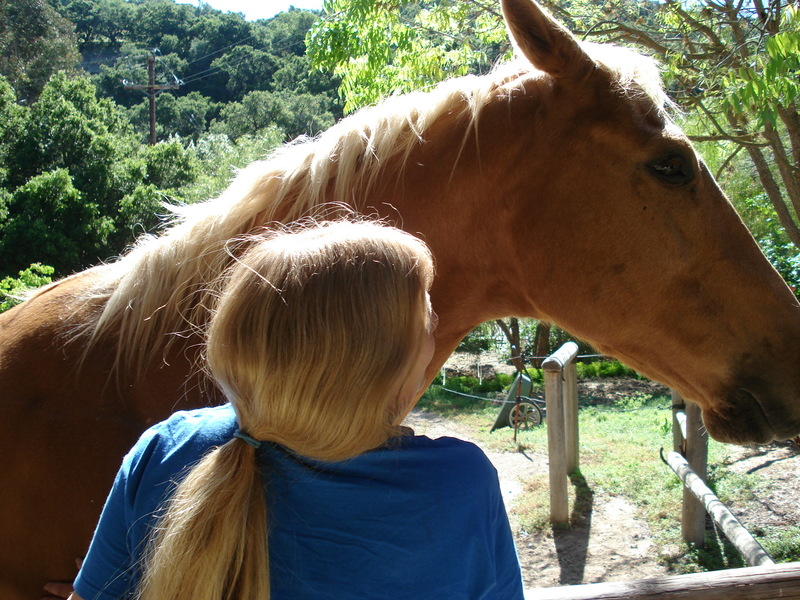 It took me right back to a place in time decades ago, when I was lucky enough to love a horse of my own. I had a blood bay hackney/welch cross mare and our relationship lasted from the time I was 14 years old until I was 35. Every one of my teenage years, I can remember climing up on her back the first day of summer vacation and not coming down until someone pulled me back down off of her because I had to go back to school. It was a great way for me to spend my impressionable teenage years. While a lot of my peers were getting into the fast lane of chasing boys or wanting cars, I was growing up strong and slow with a very different perspective of the world that one can only see from the back of a horse. In fact, I went through many seasons of my life with her, my ups and downs, my marriage and the birth of my kids, the breakup of my marriage. I lost and gained friends, was employed and not, but she remained the constaint in my life. I will always live with the conviction that “the outside of a horse is good for the inside of a person”. In her last years she had Cushing’s Disease, which took its toll. I finally had to have her put down in her 26th year. I had owned her 21 of those years. I felt I had lost a large part of myself when I lost her on that cold day in November, but in the end she died just as she had lived, with me holding on to her.